The largest changes take place in the Pampus Terminal at Händelö. To build and operate a port is regulated by various states and conditions, which may involve long processes. Construction start is established as soon as the conditions are clear and the political decisions concerning port expansion have been made. From the planned start of construction, it is about five years before Port of Norrköping can receive the first ships at the new quays. 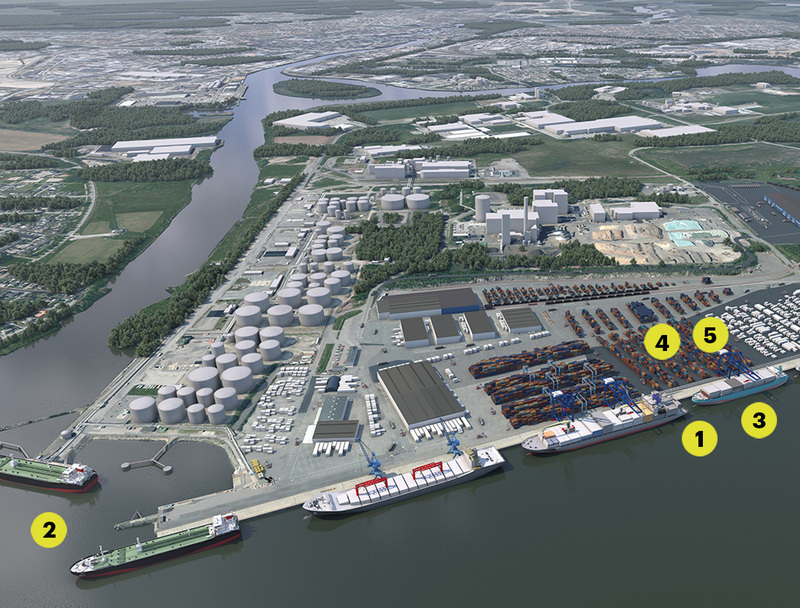 In order to implement the relocation of the port, changes has to be made at the Öhman Terminal as well. New areas for bulk handling, demolition of warehouses, new warehouses and adjustment of existing port areas are being planned for. Extended port basin with a depth of 14.2 meter means same depth as existing port basin. Additional areas of approx. 35 000 square meters at the Pampus Terminal. The new areas can be used for containers, wood products and other break bulk goods. 1. New piers extend the existing quay. 2. New mooring-post/dolphin for more flexibility at quay P2. At the Öhman Terminal we plan for new areas for bulk handling, demolition of warehouses and adjustments of existing port areas. 1. New substation, including supply to cranes. Ready in 2017. 2. New staff and office building. Ready in 2017. 3. Demolition of old warehouse to make room for new port areas. Demolition in 2018, new port areas 2019. 4. New washing facilities and workshop. Ready in 2018. 5. New carport and storage. Ready in 2018.